Baby Bear was instructed to clear out his room when he was home for the Christmas holidays. It was to prepare for the rehab of the upstairs. He bristled when I mentioned his Tipman A5. He had a point. He wasn’t angry. More hurt, I think. While I was attempting to convey my ignorance of the importance of his stuff, he wasn’t feeling the urgency I expected. I went for the jugular. It was my test case. He wanted to keep it. Honestly, this was not the best way to build momentum for an unwelcome project. Note to self: Need to work on my technique. My own mother used to annoy me by keeping me solidly preserved in amber as my 18-year-old self. It was as if I were stuck with my permed hair, big belled Levis and a limited palette of Jack and Ginger and french onion soup for a fancy date. Forever. I don’t think that she ever really knew me after I left. Not that she was trying to force me into a box. Not even that she was indifferent to me. It was more like she was unable to move her point of reference to the present. To where I was now. Every time I’d see her it was always a slide backwards. Even when I married. Even when I had kids of my own. There was still a part of her that related to me as if I were my high school self. Even when I could no longer remember the references that were, to her, au courant. Over the years it became a dull annoyance, but still. Baby Bear did a good job clearing out his stuff. He bagged stuff to donate and stuff to toss. He left some things behind with the instruction that the disposal of the remains was up to me. He knew that I would go through the kid and young adult books on the bookshelves. I already said that I couldn’t actually part with the legos. He emptied out all of his drawers. No oversized cargo shorts, t-shirts with images that were no longer funny or school ties left. There was a pile of random phone and other small electronics chargers on the top of one dresser. On the other was an array of trophies. There were maybe two or three thousand trophies. Well, perhaps that’s an exaggeration. 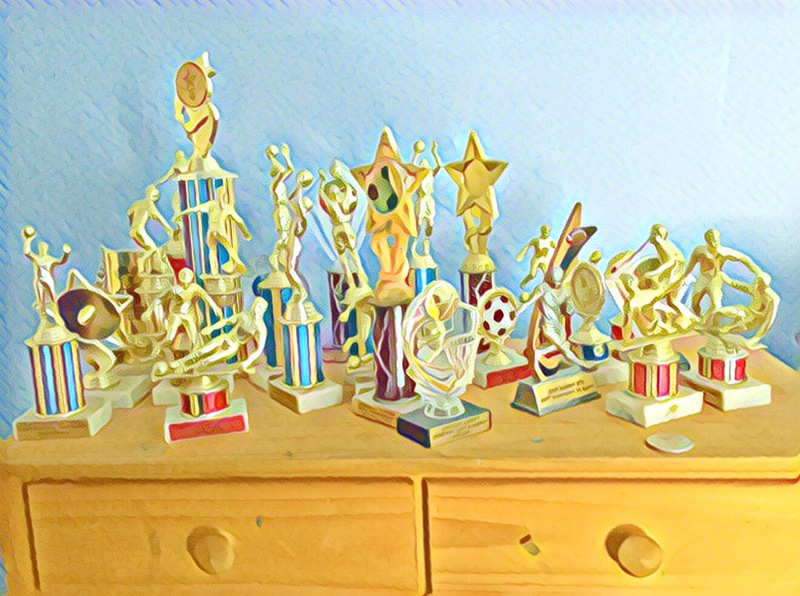 But for many years there were two seasons of soccer and one of basketball, each season ending with a requisite participation trophy. He did that for a bunch of years. Then there were camp trophies. And a science fair ribbon. And the Latin medals. And the football and baseball markers. I think there was a letter for wrestling and rugby, too. I looked at that display of accomplishment–because participation is an accomplishment, too–and wondered why they didn’t make it into a bag. Did he think they were important to me? Did he not want to be the one to physically let them go? But he did let them go. He was done with them. He took what he wanted and moved on. I was using childhood tricks by poking Baby Bear with the one item I knew he wanted to keep. I was stuck in that oppositional place where I con him into an action. Actually, though, he’s beyond that. I looked around at the relatively little he left behind. He lives seventeen hundred miles away. I think about him taking care of himself. Without my daily admonitions. He’s got this. He’s moved on. Me too. I am renaming him again in this blog. Starting now, he’s Bear. Just Bear. He’ll always have a place to stay here. We are remodeling his room, which will remain his room. If he wants it. Both Bear and Doc are on a growth trajectory. I’ll toss the trophies. He has other things to do.